FRENCH LICK, IN —Take a four hour drive and find a hidden jewel in French Lick, IN.Upon arriving in the lobby of the French Lick Springs Hotel, visitors are welcomed by ornate French detail and luxury. 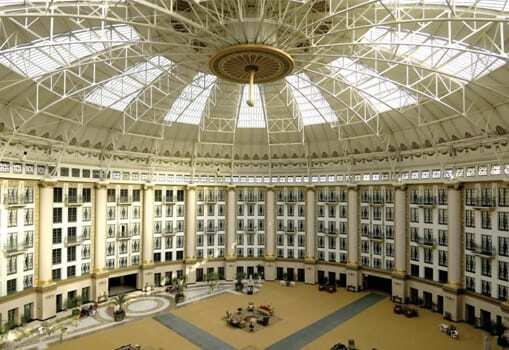 It is the perfect blend of class and conduciveness for the entire family.Its counterpart, West Baden Springs Hotel recently restored its grand rotunda, which is sur-rounded by beautifully furnished guest rooms. The hotels at French Lick Resort are located in the Hoosier National Forest, where many mineral water springs freely flow. Residuals of salt on the rocks from the springs at-tracted deer and buffalo to lick the salt off the rocks, hence leading to the name French Lick. West Baden Springs Hotel and French Lick Springs Hotel exemplify French artisan class and comfort in the heart of the Midwest. There is something for everyone at the expansive resorts and surrounding areas. Kids will be entertained at Pluto’s Alley, an indoor bowling alley with a pizza parlor and bar. Bowling and Pizza nights will enterain kids while adults can enjoy the resort. The Kidsfest activity center, a facility designed for ages 6-12, is run by trained counselors so the entire family is promised a good time. The Stables at French Lick offer horse rides, pony rides and carriage rides. Bikers and hikers can enjoy the property on such trails as the Buffalo Trace Trail, an upward climb of 6 miles. Golf enthusiasts can choose from one of three courses designed by golf pros Donald Ross, Pete Dye and Tom Bendelow. The Pete Dye Indiana Golf Course offers fine dining at the Pete Dye Mansion. And for the perfect downtime, relax at either The Spa at West Baden or French Lick. The Spa at West Baden offers a two-level natatorium with a full-service spa, 12 treat-ment rooms, a full-service salon and health club with an indoor lap pool. The Spa at French Lick offers 24 rooms and the legend-ary Pluto Mineral Bath.Experience a holiday glow with the Classic Fa-cial which consists of a synergistic complex and mild enzyme peel. A ther-apeutic hand, shoulder and foot massage is included. The spa provides the per-fect balance of tranquility after a round in the casino.Take a dive in the pool or relax in the hot tub which is outdoor at French Lick or indoor at West Baden.Choose from area at-tractions as Big Splash Adventure Indoor Water Park & Resort, part of French Lick, The Indiana Railway Museum and more. Find more information, visit www.frenchlick.com.The Holidays are a special time of year at French Lick Resort The premier Midwest resort destination pulls out all the stops to create a festive atmosphere, wonderful holiday entertainment and lots of opportunities for families and friends to create memories that will last a lifetime. Here are the top ten reasons to visit French Lick for this holiday season: Pretty as a picture, West Baden Springs Hotel sparkles even more during the holidays. Your holiday experience begins as you travel through the lit archway and onto the grounds of the magnificent wonder. The cobblestone driveway lined with festively lit trees, twinkling gardens and old-world charm sets the scene for what’s to come. Step inside this ultimate holiday destination and your jaw will drop at the sight of the holiday show-piece that rises from the center of the atrium. The 40 foot tree with nearly 50,000 lights is a sight in and of itself, but, the base makes it even more dramatic. The 8 foot high perch pays homage to the angel murals found high above the dome in a secret room. Just a mile away, French Lick Springs Hotel is a sparkling holiday wonderland in its own right. From the 40 foot outdoor tree with vintage toys that greets you as you arrive to the more than 25 different trees situated around the hotel, holiday spirit is found around every corner. Festive vignettes and beautiful backdrops create the perfect locations for your holiday photos.